The toddler phase gets a bit of a bad rap in parenting circles, but personally I adore it: the busy way they get around on their chubby little legs, the random swear words that come out of angelic faces when you least expect it and the way they love pushing things across the floor like it’s their job. If you’re unsure about the toddler phase and have bought into the negative hype, here are eight things you won’t miss about your baby now that she’s fully, upwardly bipedal. Babies just scream their heads off and no one knows why. At least with a toddler you’ll know why they’re screaming. And sure, it will probably be something really dumb like, “My underpants have polka-dots on them!” or “I wanted to keep that sweaty old cube of cheddar you just threw in the bin!” But knowledge is power, my friend. 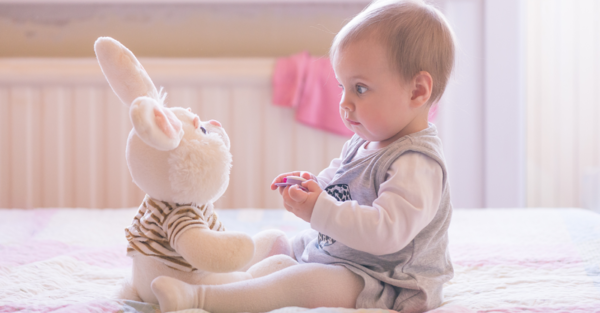 The exact timing of baby milestones is a mystery to all of us: while the baby books will give you a ballpark timeframe, the precise moment certain things will happen cannot be predicted. Which means, your baby will go from lying like a docile beetle on its back to suddenly working out how to roll over and off the change table in the blink of an eye. It’s the way they lull you into a false sense of security – lying there for months on end like they have no intention of ever rolling – that makes it all so unrelaxing. Once you have a toddler, you just KNOW that they’re always on a mission to bonkle their head on something, touch something hot or poke themselves in the eye with a stick. So you’re in a constant state of safety vigilance by design. It’s so much less alarming than the sudden ninja roll off a change table. Those lolling heads on rubbery necks are such a draining responsibility in the baby phase. You have to constantly, CONSTANTLY remember to ‘support the head, support the head!’ Nothing says freedom like a toddler who can hold up their own head and be slung across your hip like a sack of potatoes. Yes, they’re handy, but it sure is great to be liberated from the constant presence of a marsupial pouch attached to your person. Your lower back will rejoice. When I had my first baby I bought the biggest pram monstrosity on the market so that I could ferry my precious cargo through the streets in a padded chariot. However, that cumbersome bed-on- wheels contraption soon lost its appeal when I realised that not only would it not go through a standard supermarket check-out but it cornered like a prime mover. As soon as my baby was sitting upright I happily jettisoned that thing for a light-weight aluminium stroller that I found on the neighbour’s hard rubbish pile. (I know! Hygiene be damned, it was free!) We called it: The Speedy Speedster. It was basically a sling chair on very small wheels and she cornered like a dream. I bloody loved that thing! It slipped easily through supermarket checkouts, raced over footpaths like a silver streak and did someone say ‘uh-oh stairs’? Just fold it up and carry it in one hand. HEAVENLY! Oh the portacot, how I loathed thee, let me count the ways. Carting that thing around in the boot whenever we went on holidays, taking it to dinner parties or to my parents’ house for Sunday lunch. Trying to put it up in someone’s spare room without having a marital incident (the mattress goes in AFTER you’ve put the frame up!) and then trying to fold it back up again without losing a finger. I loathed it. But the toddler years? Say hello to a cheap fold out couch that you can throw in the back of the car and take everywhere. No assembly required, have Winnie The Pooh couch, will travel. When your baby first starts sitting up, you can never relax. Will she keel over backwards when you least expect it? Can you leave the room momentarily without hearing ‘bonk WAH!’? I used to construct a crash mat of pillows and blankets behind my first born child when he was first learning to sit up. (Neurotic? Moi?) And I dreaded that ‘Bonk! Wah!’ combination when he unexpectedly keeled backwards from his hitherto stable sitting-up position. It was like the roll over thing, it could happen in the blink of an eye and without apparent explanation. I think this is was probably my most hated thing about the baby phase: those pointless baby swimming lessons where you stand in chest-high water, dunking your baby in and out singing dumb songs with other embarrassed mums because that’s ‘fun for baby’. Kill. Me. Now. Proper toddler swimming lessons are so much better. You get to sit on the sidelines, stay dry and watch them actually learn how to swim … by themselves … without you standing in the wee-wee water getting all pruney. What do you not miss about having a baby in the house? Join in the conversation on Facebook.